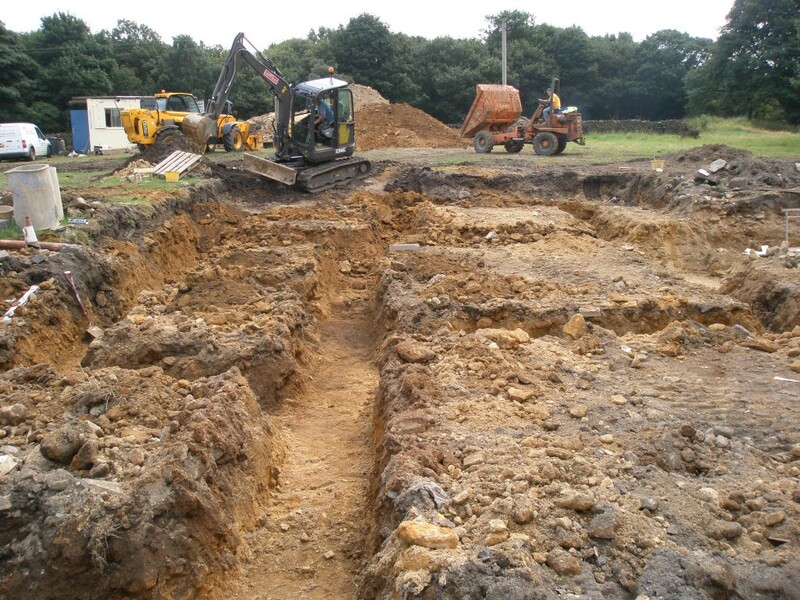 We have cleared the land and dug the footings and foundations for the new extension. 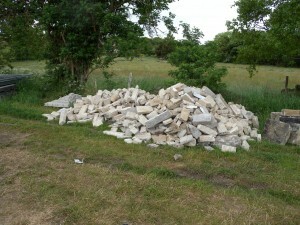 The intention is that these will be concreted on Saturday morning. 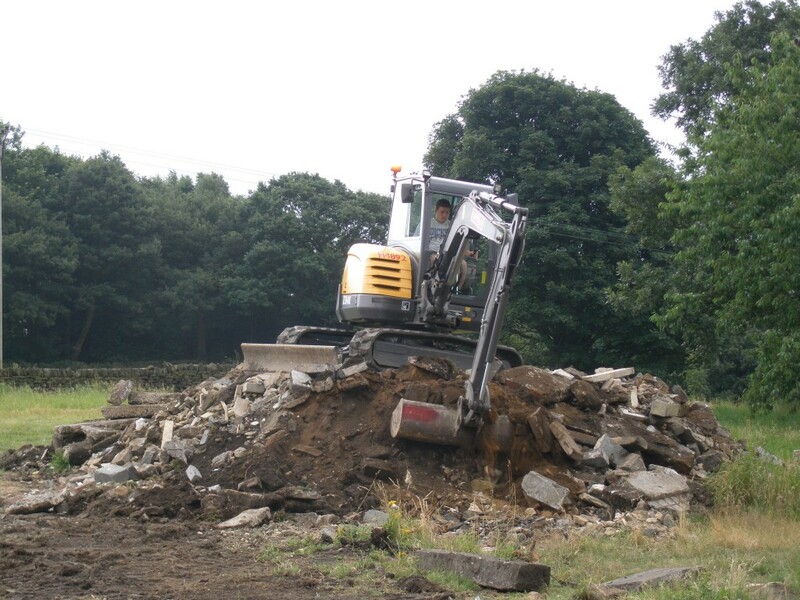 There is a lot of work that has gone into this and the spoil heap is looking quite impressive. Fortunately, we are going to spread this onto the back field to bring the soil level up. 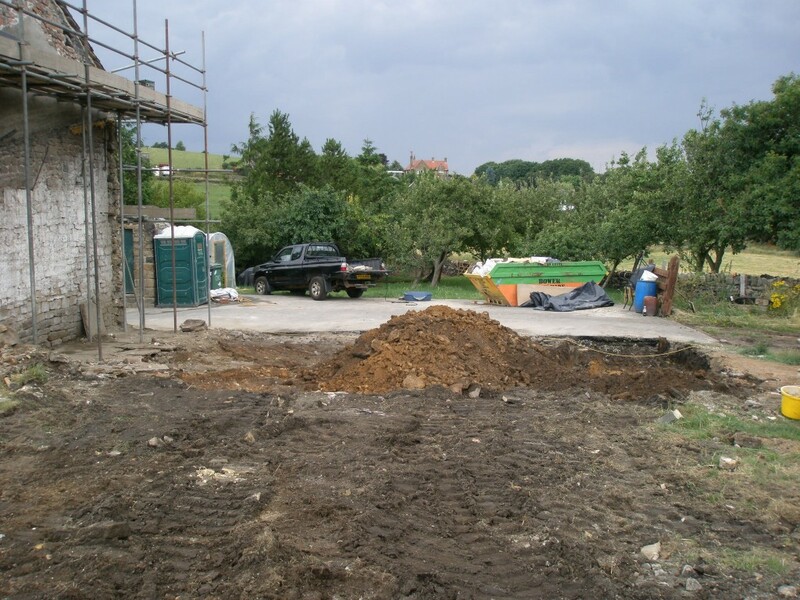 This will help with the ground loops for the ground source heat pump as the ground loops need to be 1m under the surface. In some places, we might have struggled to reach this depth. Increasing the ground level is only going to help. Foundations and footings now dug. We have accumulated a lot of subsoil and topsoil in the process. Everyday this area looks different. I daresay that it will look different again once the concrete has been laid. This is due to happen on Saturday. 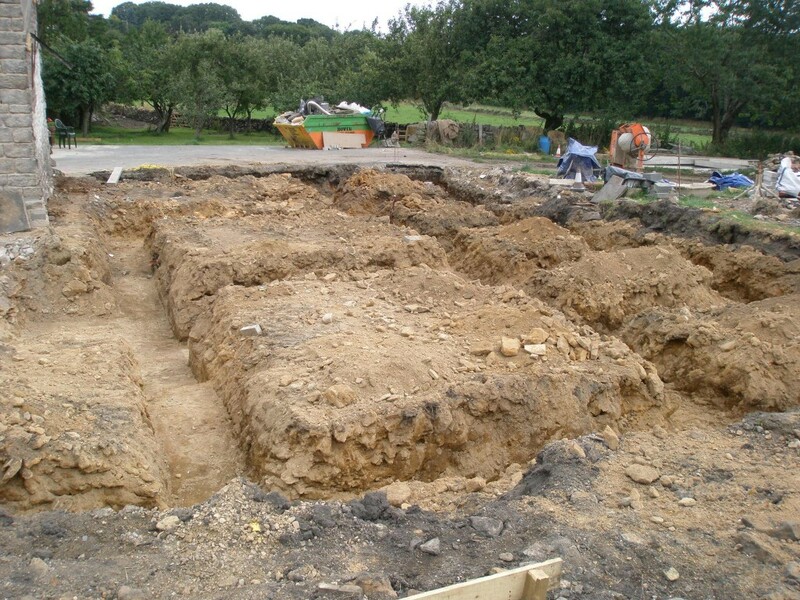 The footings are going to be concreted on Saturday morning. Tomorrow we need to cut the steel mesh that goes into the base of the trenches to reinforce the concrete. It looks very different once the footings are dug. The deep trenches mark on where the internal walls will go. 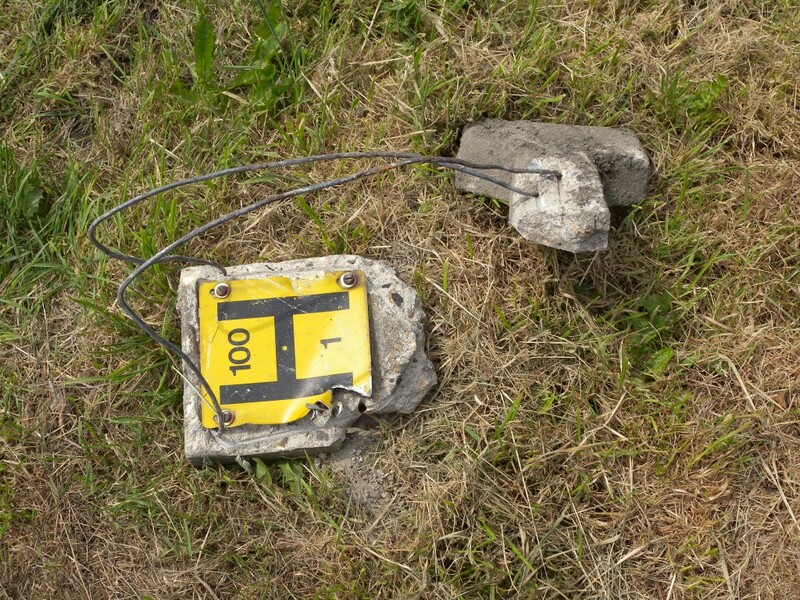 When we first bought the property, there was a fire hydrant sign on a concrete post next to the extension. Unfortunately, when we demolish the extension (to rebuild it), the sign was “collateral damage”. While we have kept the remains, it isn’t much good. So who is responsible to replacing this? It looks like it is the local fire service. I dropped the local fire service an email via their website over the weekend and got a phone call yesterday from the “Water Officer”. He is going to come out and have a look at replacing the sign. The old fire hydrant sign hidden behind the grass before the extension was rebuilt. Oops! We need to get this replaced, but we will reattach the plate to the wall once re-built as a temporary measure. We are really starting to move into Phase 2 (Building the new extension), even though we have still to finish off Phase 1. 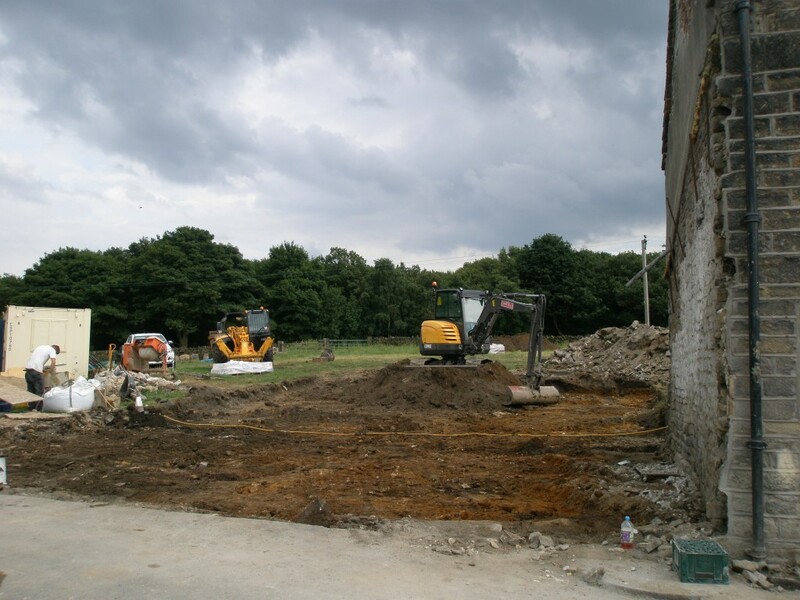 In terms of Phase 2, the barn has been completely demolished and we have now taken off the top soil in preparation for digging the footings. This is the first time that we have seen the full extent of the Phase 2 extension. I am not sure what I am meant to think, but it does look big at this stage. I can’t remember on Grand Designs whether people think their footprint is bigger or smaller than they thought. I wish I had paid more attention now! 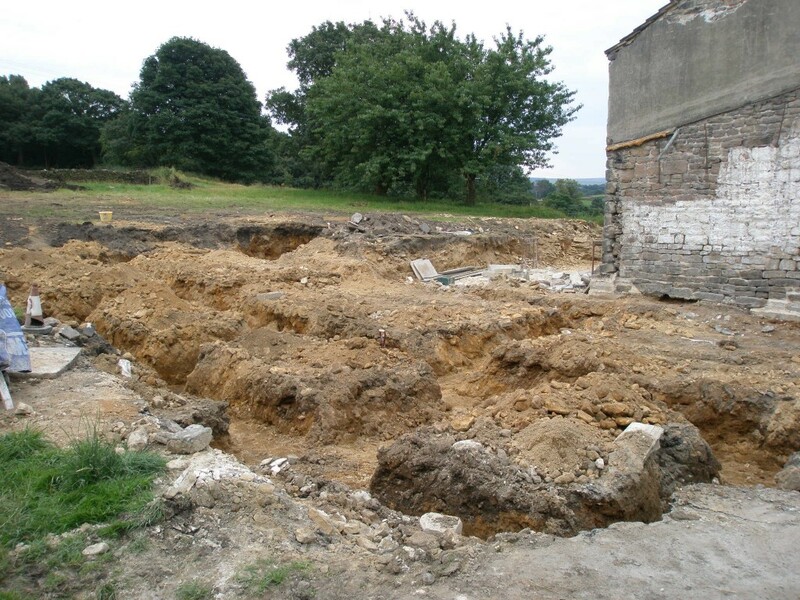 Now the barn has been completely demolished we can start to see the footprint of the new extension. 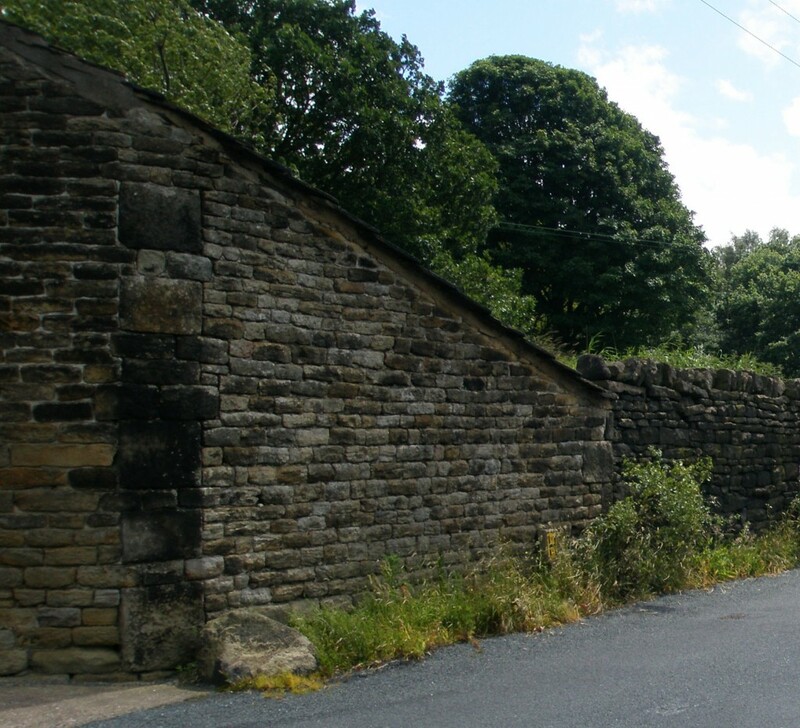 Looking at the existing cottages end on, this still looks like a large extension. The spoil heap seems to be growing. Unfortunately, we started it close to the corner of the foundations and now it is going to have to be moved. But it doesn’t take long with a 4.5 tonne digger! We have also come across another soakaway. 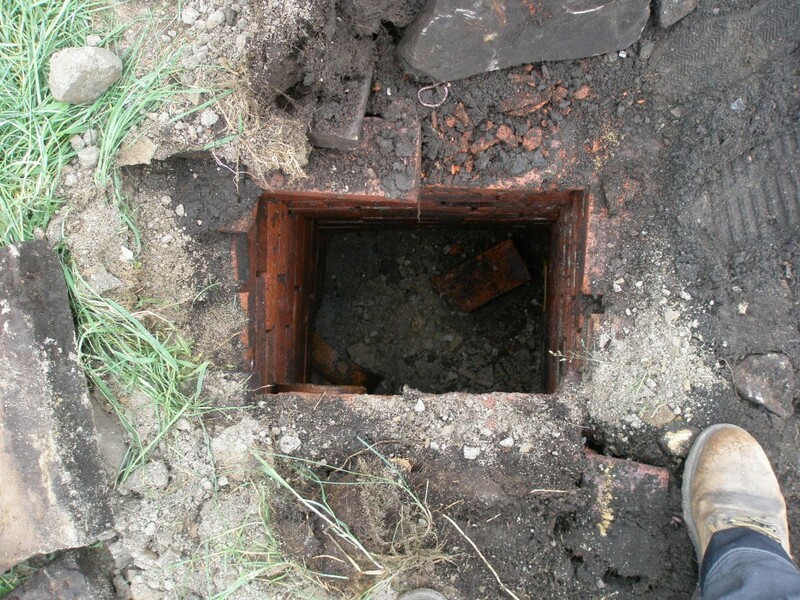 It is brick-built and matches the other one that we found at the end of last year. They are probably connected and used as a soakaway for rainwater from the drainpipes. The spoil heap just keeps on growing! Zep is checking for any undiscovered pasties! A mixture of soil and waste stone. Looks like this is connected to the other soakaway that we found a few months ago. The barn is now a thing of the past. With the aid of a 4.5 tonne digger. 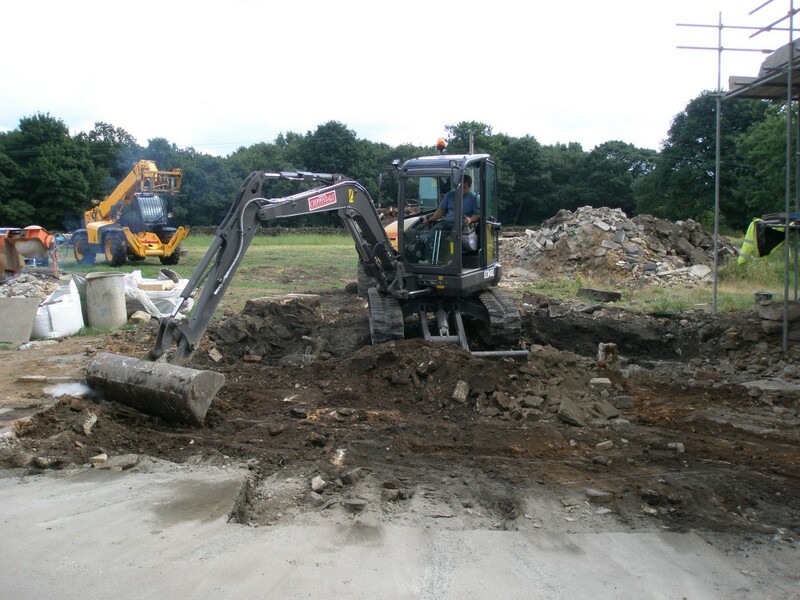 It made quick work of demolishing the stone work that was left and loading the rubble into a dumper. The spoil heap is now getting pretty impressive. 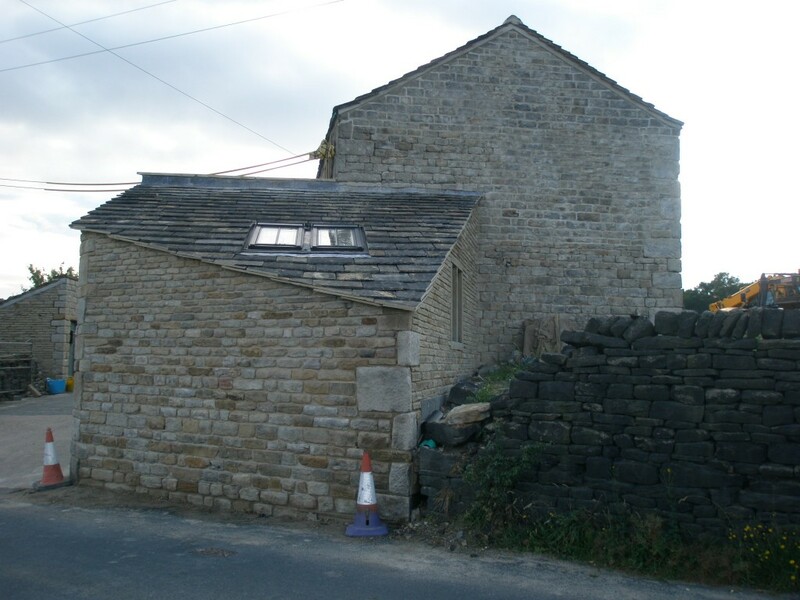 The stone on the front of the barn will be re-used, however, much of the stone is only good for building dry stone walls. Fortunately, we have a lot of these to do. 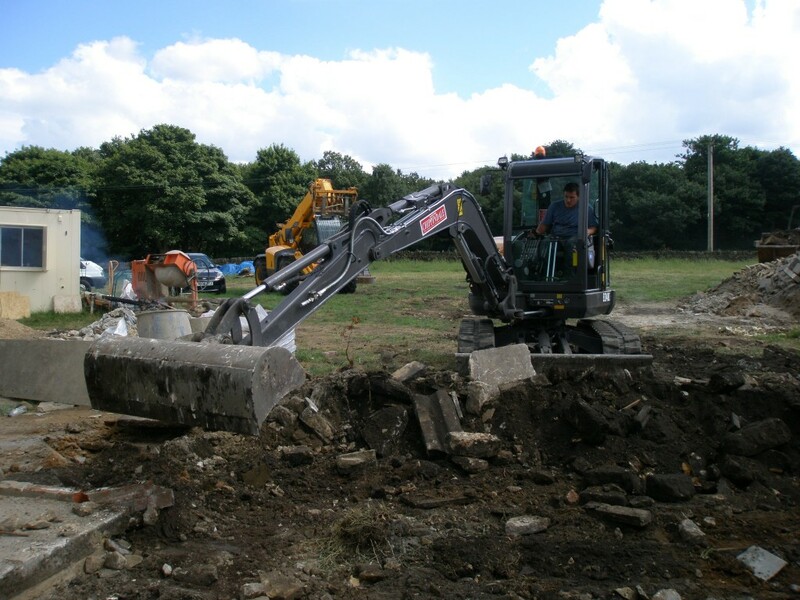 Matt at work with a 4.5 tonne digger. The spoil heap (in the background) gets bigger and bigger. Matt at work removing the foundations of the barn. There wasn’t much of a foundation to talk about. 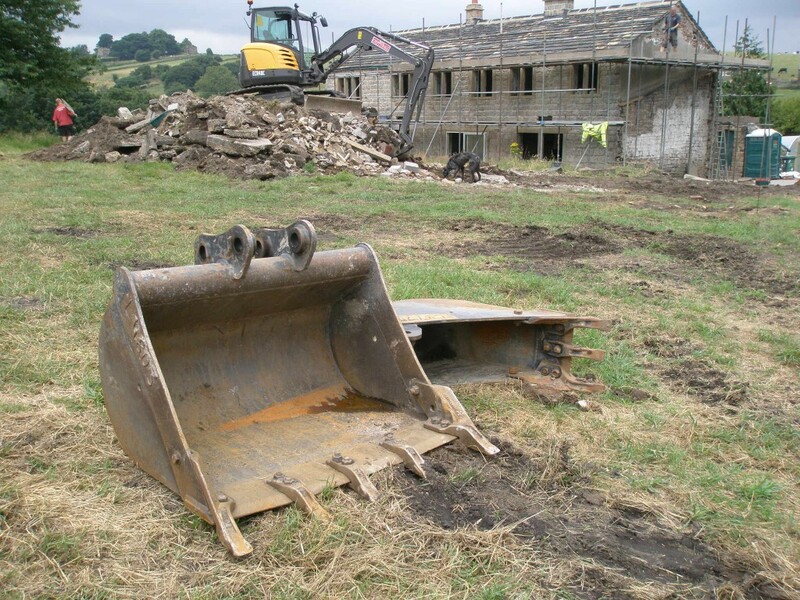 A 4.5 tonne digger soon makes quick work of demolishing the old barn. This used to be the base of the foundation of the barn. 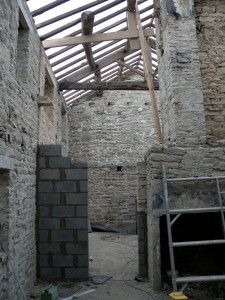 In the hot weather, the builders carried on demolishing the barn. With the temperatures reaching 30C, this was a horrible and dusty job. Despite the hot weather, the barn is almost gone. 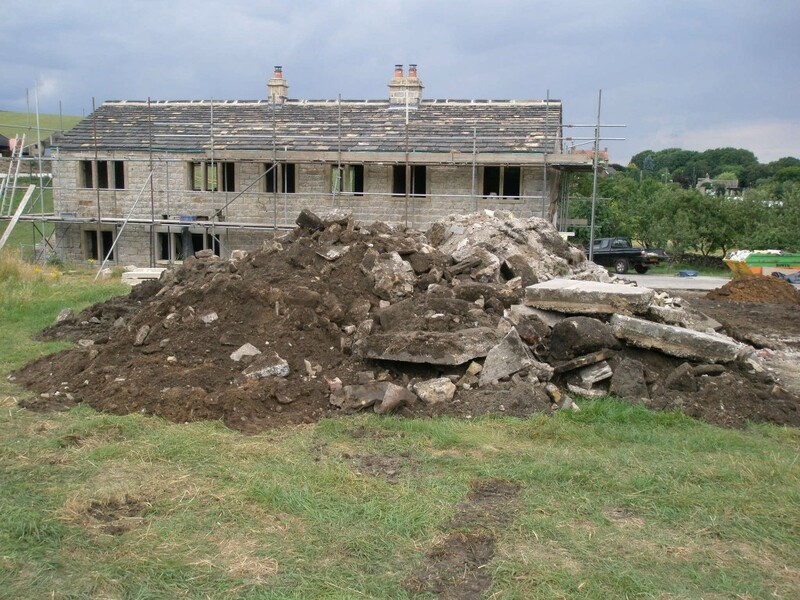 Much of the stone from the barn is going to be used to build the new extension, so it is being taken down very careful (well, as carefully as 200-year-old walls will allow). This is the start of Phase 2. 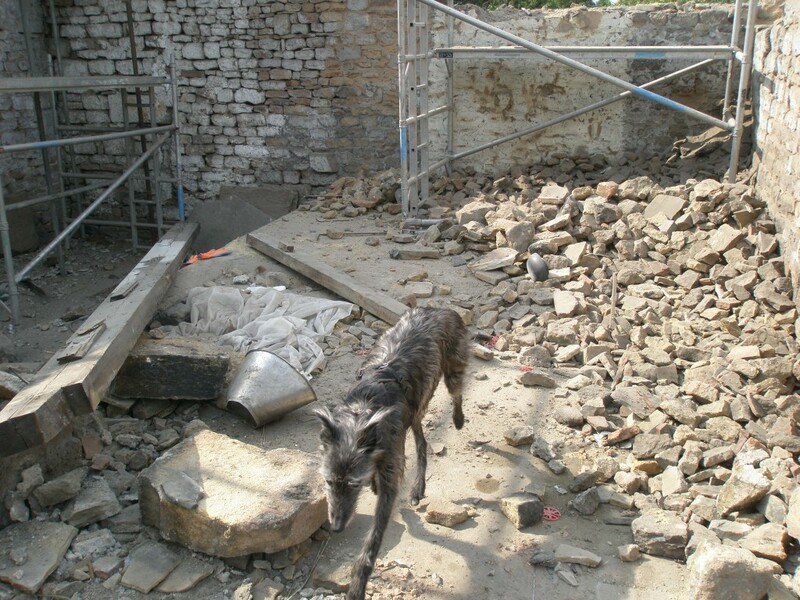 We are going on with the demolition work and possibly the concrete floor base while the architects are finalising the design details. With the temperature touching 30C, this is hot and dirty work. Which is why I am building the dry stone wall in the bottom field! This is where the kitchen is going to be. Can you see it yet? 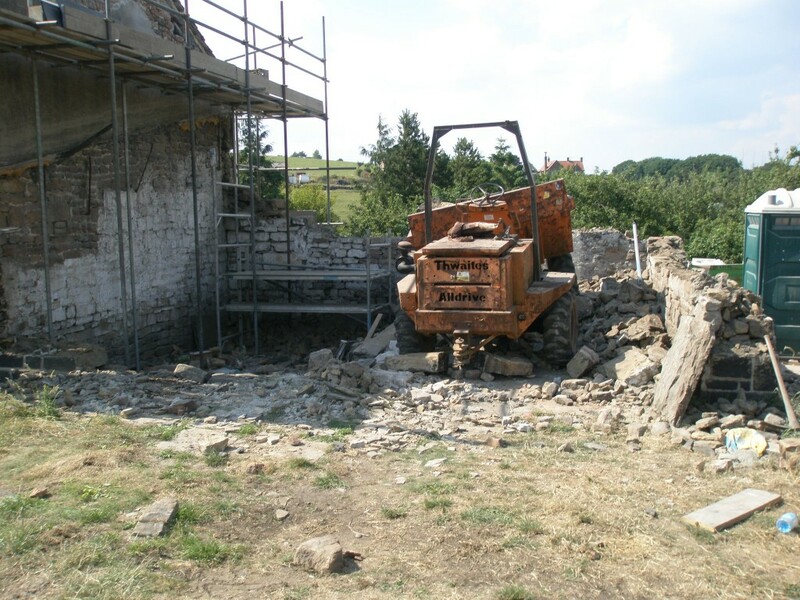 The barn is being taken down very carefully as we intend to re-use as much of this stone as possible when building the new extension. Zep on “Pasty Patrol”. No luck today. Better luck tomorrow. 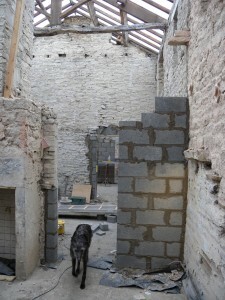 The first phase of construction work (the renovation of the existing cottages) is drawing to a close. I reckon we will be complete in the next 2-3 weeks. This means that some of the men are coming free from the existing building work. 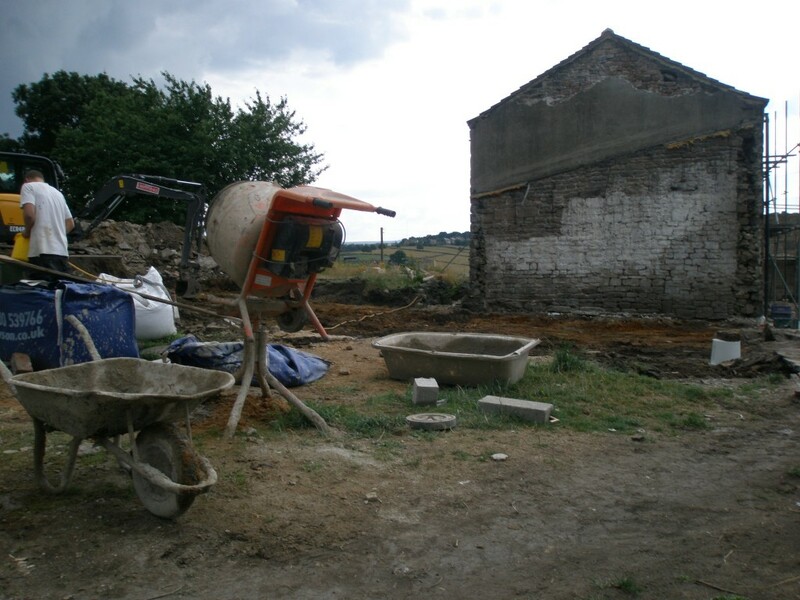 Although the architects are still working on the detailed design for phase 2 (the build of the new extension), we have decided that we can start on the demolition of the existing barn and laying down the new concrete base. This should provide the architects with a little more time to finalise the overall design – the concrete base is not going to change (well, not without having to go back to the Planning department). The roofline of the new extension will be slightly below the existing roofline. This means that part of the gable end will be exposed. 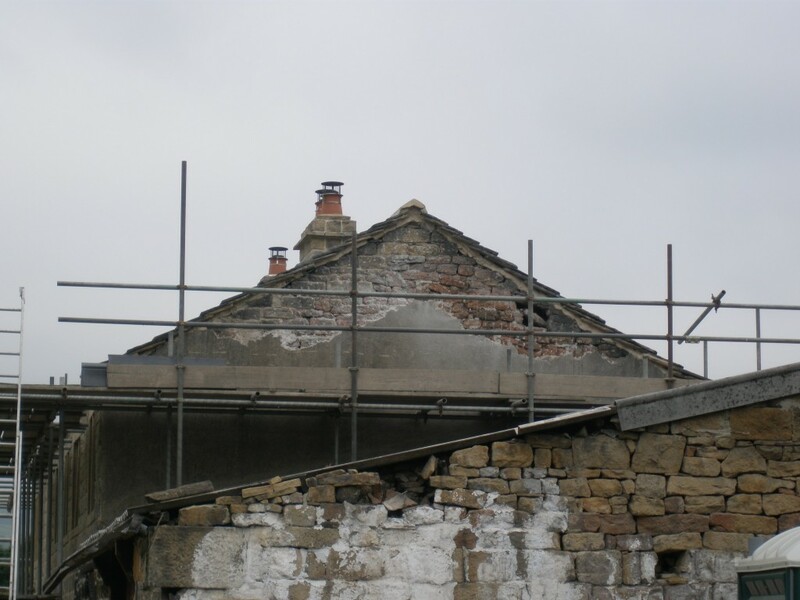 This means that we need to hack of the existing render and either re-point the stonework or render the gable end. 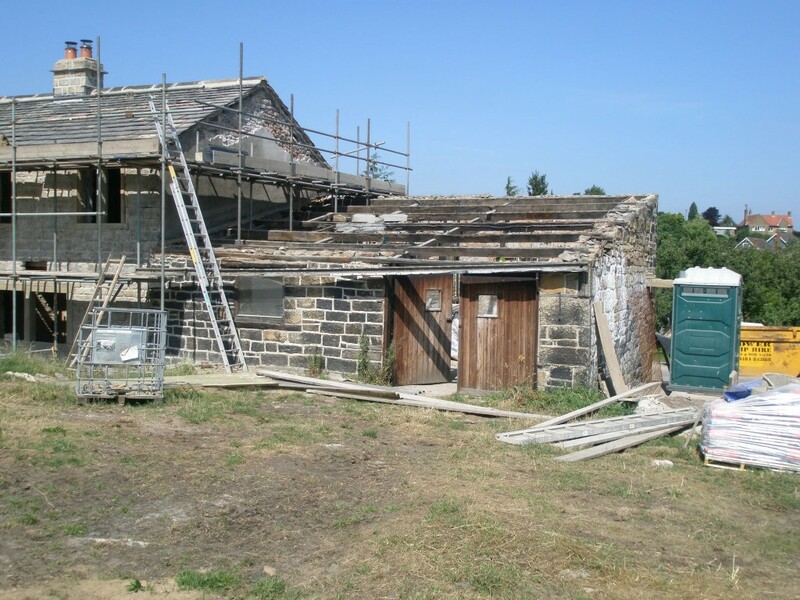 As part of the phase 2 work, the barn will be demolished and rebuilt. The roof line of the new extension is going to be lower than the existing roofline. 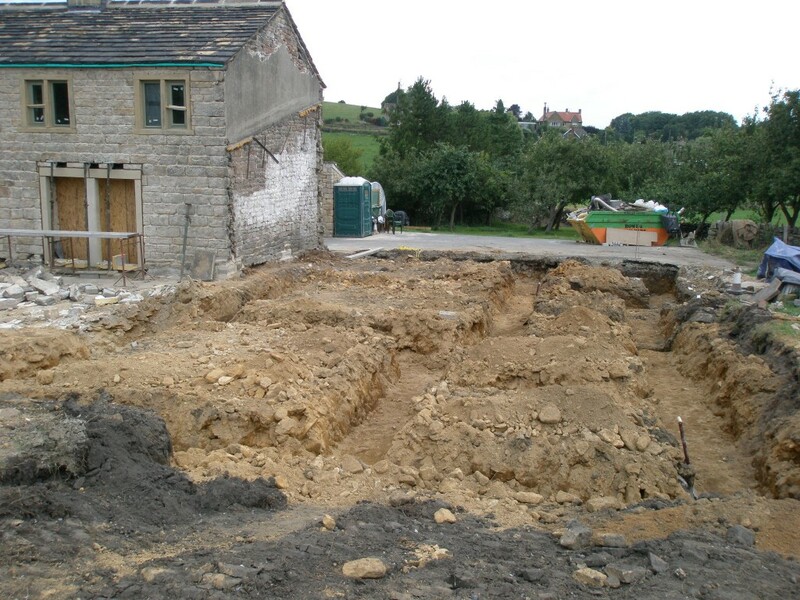 This means that part of the gable end (that is currently rendered) is going to be exposed. We need to remove the rendering to check the quality of the underlying stone. One of the internal walls has had to come down. It already had a couple of bricked up doorways in it and trying to make two new doorways just introduced the risk that it was going to destabilise the wall. The decision was taken earlier in the week to take it down and replace it with blockwork. By Wednesday, the new wall had started to re-appear. Fingers crossed, it will be finished this week. While the wall is being re-built, the roof is being propped up. This saves having to dismantle the roof, but it does look a little precarious. 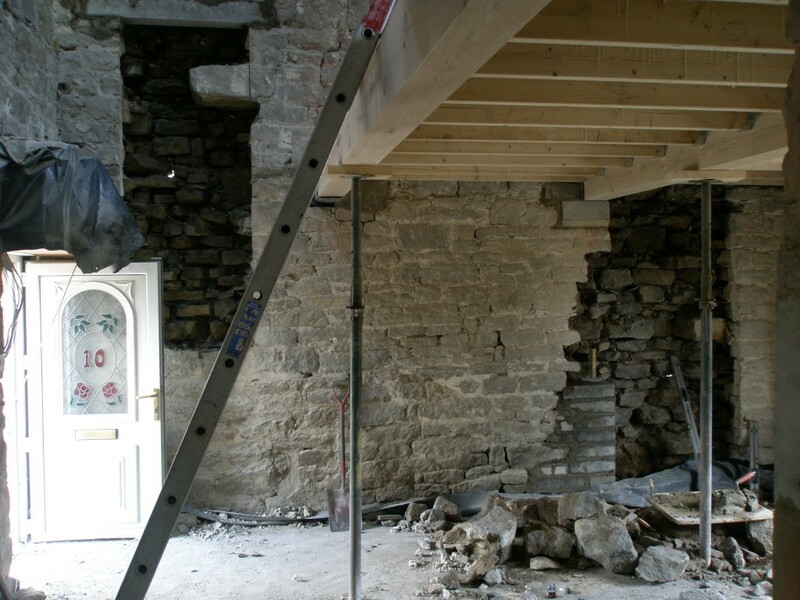 The stone from the wall is very similar (if not identical) to the other internal wall that we had to remove last week. It is likely that this stone will be reused on one of the internal walls in the kitchen (when that is built as part of phase 2). So the mound of stone in the back field just grows bigger. The start of a new wall between number 9 and number 10 – there were just too many alterations in the existing wall for it to be safe. The new wall seen from the other direction. Zep conducts his daily inspection of the building once the builders have gone home (looking for any leftover pasties!). Note the tie beam on the king post truss in the background (the big beam running horizontally). This is going to be replaced as part of the renovation. The carpenter tells me that he thinks that this beam is original. some of the best stone that we have found so far. Fairly square and pretty regular. We wll probably use this for the internal wall in the kitchen as part of the phase 2 build.